Today is the day to put on a show with the new Jam and Band Musical Microphone from Fisher Price, featuring a mike that really works. The musical activity center is full of instrument play, sing-along songs and busy activities. The microphone amplifies baby's singing and talking back to baby. Baby can press the light up piano keys for one of six sung songs and fun sound effects. 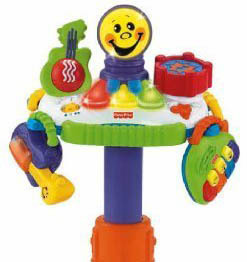 A guitar and drum are on the Jammin Band mic stand that baby can press to get fun musical songs and phrases. Two detachable instruments are included: a maracca and tamborine.